Kozzmozz is definitely on a roll and we intend to keep it that way. After several sold-out editions in a row, we present you again strong artists who have been at the forefront of techno for a long time. It’s clear that techno is back more than ever and has been gaining strength in Belgium over the last years. And so is Kozzmozz! We’re here to stay! During his 15 year career Ben Sims has only be growing being involved in no less than 9 leading labels and having remixed the biggest techno names around as Jeff Mills, Green Velvet, Chris Liebing and Adam Beyer. Last year he released his long awaited second album, Smoke & Mirrors, on Adam’s mighty Drumcode label. He’s known for his tight 3-deck sets and big techno projects as Frequency 7 with Surgeon and Killa Productions with Paul Mac. He performed in both projects on last year’s Tomorrowland and we are happy to welcome him on our Kozzmozz stage solo once again. And also Heiko Laux is no stranger to Kozzmozz, he was with us during the first years at Kuipke, in 1998 to be precise. He revisited us a couple of years ago and now he’s back. And why wouldn’t he be … 5 great albums, a string of quality ep’s and a label that brought us almost 150 great releases. A man with many faces and talents, he kept Kanzleramt at the forefront of the techno scene since 1994, just like us! As usual, we also have a black horse on the line-up and this time it’s Traversable Wormhole who mysteriously released 5 volumes of tracks with the same moniker getting attention of lots of big players. The project got picked up by Chris Liebing and his CLR label who remastered and rereleased all the tracks. They also got remixed by names as Surgeon, Marcel Dettmann, Sleeparchive, Function, Chris Liebing, James Ruskin, Peter Van Hoesen, Terence Fixmer and many others. Here he will be bringing all the gems live! And for those who don’t know, Traversable Wormhole is hot and none other than Adam X, one of techno’s most respected names, whose career spans over 2 decades. 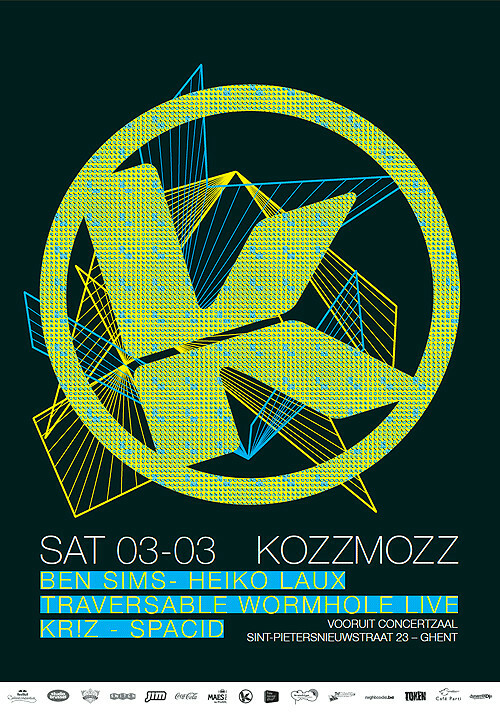 This is the first time that he will be performing in Belgium as Traversable Wormhole. This top of the line-up will be supported by our residents Kr!z from Token Records and Spacid for another amazing voyage through the Kozzmozz of never-ending beats.